Our very 1st "Holiday Wig Party"
Can we just start by saying we LOVE WIGS! We love them so much that we are having a WIG PARTY... 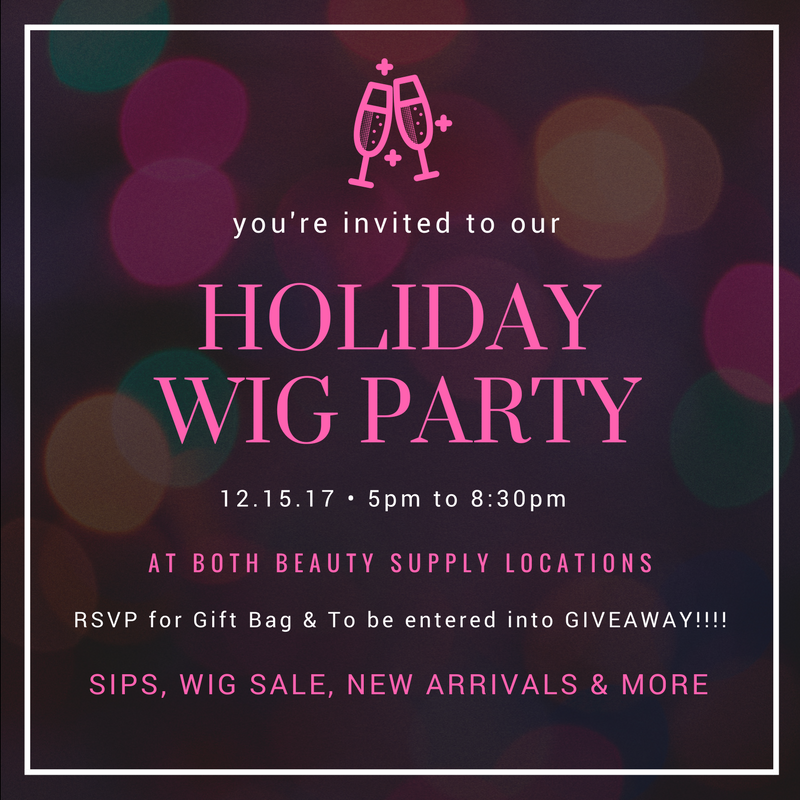 Yes a party, to introduce new wigs, cheap wigs, and just a fun time for you and your girls to come out and give wigs a try! OFFICIAL GRAND OPENING EVENT FOR TGCLA CRENSHAW P.S. YOU'RE INVITED! We are so excited to celebrate the official grand opening of our second beauty supply store in Inglewood this Saturday, October 7th, 2017. We opened our first beauty supply location on Saturday, April 1st in South LA we can't believe it's been 6 months already. We also can't believe this is location #3 for TGCLA brand! We are extremely grateful, just know what started as a skin and hair care line has turned into so much more and we couldn't have done it without the amazing support of the community and our loyal customers. Our mission and vision is to change the narrative of the beauty industry with one black owned beauty supply at a time while also supporting and empowering both men and women to join us in taking back the industry. Our hopes for growth rest upon staying aligned with our mission, vision, and brand promises to provide superb customer service, great pricing, and a sense of community to the residents of South LA and now Inglewood. We can't wait to celebrate with you! Join us this Saturday at 10901 Crenshaw Blvd. Los Angeles, CA 90303 we'll be open 8:30am to 8:30pm. Psss, the first 100 customers will get a product goodie bags. We are Excited to Announce "Do Good Thursday's"
There is more to Fashion & Beauty than the business of it! The Girl Cave LA wants to do and be more than just another new business opening up and profiting off the surrounding communities without giving back. We recognize that without you, there is no us. Our hopes are to engage, give back, and be the change we wish to see! So how does one do that? We believe that we can do that by "Doing Good" we are deeming every Thursday a day for us to "Do Good" in our local and surrounding community. So if you know of a person, family, group, or non-profit that has a need please let us know! You can submit your request of nominate someone or their organization by emailing us at thegirlcavela@gmail.com our team will select a handful of organizations every Thursday to give back to with the hopes of creating a positive and long lasting impact in and on OUR community. Lia Dias, ultimate #browngirlboss and serial entrepreneur, is all about empowering women and influencing the current scope of the beauty industry. This Inglewood native is the proud owner of The Girl Cave Los Angeles, a beauty bar, boutique and show room, which opened July of 2016. She is also the owner of a juice bar, a real estate mogul, and former model. Her newest venture entails expanding The Girl Cave Los Angeles brand with the opening of The Girl Cave LA, Manchester, The Beauty Supply. The grand opening on Saturday April 1st of this year was a resounding success. Her brand is not just about beauty but about empowering women and girls to follow their dreams! So if you're ever in South LA be sure to stop by 1855 Manchester Ave. Los Angeles 90047. Also if there is a brand that you absolutely can't live without if they don't already carry it, they'll get it! Also want to stay in the know of all things "The Girl Cave LA" and be the first to know about exclusive offers, happenings, discounts, and deals? Sign up with your email below!